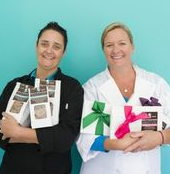 Lisa and I launched our company and Salty Sisters® line of salted caramels and toffees at our local farmer’s market in July 2011. We followed this up with our Saucy Sister Boozy Caramel Sauce line in April 2013. There are so many aspects of “success”. Although making money is at the top of the list for many entrepreneurs, quality of life is extremely important to me. I worked behind a desk for most of my working life. Most recently, I worked as a community college administrator. I commuted 2 hours every day and managed 3 divisions. I loved the work, but the rewards were always very slow to be realized and my family never saw me. As a candy maker, my rewards are immediate. 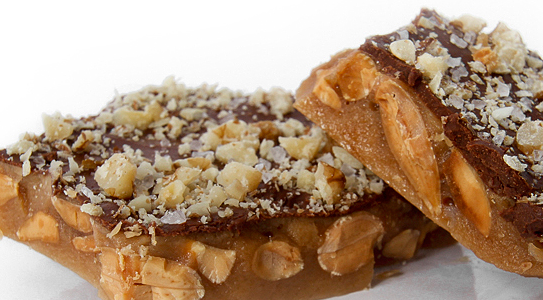 There’s nothing better than making an amazing piece of candy and watching my customers respond, “Holy cow! That’s the best candy I’ve ever tasted!” Plus, not only do I see more of my kids, they love that their mom makes candy for a living. We aren’t quite “there” yet in terms of making the big bucks, but our quality of life is headed in the right direction! The biggest challenges for us have definitely been the steep learning curve, cash flow and space planning. We started making our salted toffees and caramels at night in a shared kitchen rental and selling through our local farmers markets on the weekends. The hours were horrible; we had to carry all our ingredients and materials back and forth to the kitchen and share the space with caterers and food truck operators who worked with raw meat. Luckily, we grew so fast that I was able to quit my day job and we opened our 4,000 square foot production kitchen along with our first retail shop within 12 months of launch. Of course, this presented an entirely new set of challenges: FDA regulations, human resources, payroll, merchandising, advertising, etc. The time between conception and launch of Sea Salt Candy Company and our “Salty Sisters” line of salted confections was less than 90 days. We invested about $7,500 of our personal savings with most of it going toward branding. We realized that we only had one chance to launch this business and we wanted to make sure we came out with a bang. The branding agency we used was fabulous and really saw what we were trying to create: a brand and product that captures and highlights the best of California. They created our mermaid logo, color scheme and website. My best friend helped create our tagline “Sweet California Sunshine Kissed with Sea Salt”. 5. Please share your insights and advice for new to industry companies. What decisions influenced your choice to become a Member Candidate? How was the Show as a Member Candidate? 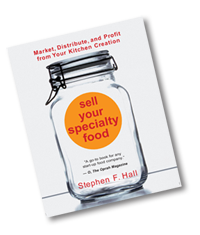 My first experience with the specialty food industry as a whole was at the 2013 Winter Fancy Food Show when I walked the floor. I don’t think my head stopped spinning for the entire first day. I had never experienced anything on such a grand scale in my life (I think I ate my weight in cheese)! After that experience, there was no question in my mind that we needed to be a part of it the next year. We also saw that we were not even close to “shelf ready”. We spent the next 6 months working on our products, packaging and price points. We replaced corn syrup with an eco-farmed brown rice syrup in all our products, refined our color palate and packaging to maximize shelf life (this is an ongoing challenge) and made sure that our prices were competitive within our categories. For the 2014 show, we focused on creating a booth that reflected our desired image as a super-premium brand targeting a high end, well-informed consumer. Attendees expressed appreciation for the freshness and uniqueness of our products and loved our booth design. For new industry companies, my advice for the Show is DO IT! Our Vision is simple: Be the #1 company in the world for salted confections. In 5 years, we would like to have our products well established in gourmet outlets worldwide. We are even playing around with the idea of franchising our retail outlets. In 10 years we’d like to sell the company and start on our next idea. What can I say? I’m an entrepreneur! 7. What benefits did your company experience as a member candidate? What was your experience at the Show? We have received so much support and information from the Specialty Food Association and the benefits of the show have exceeded anything we imagined and hoped for! Absolutely everyone we hoped would walk in our booth, did, and then some. Of course, the work has continued after the show as we follow up and negotiate deals.